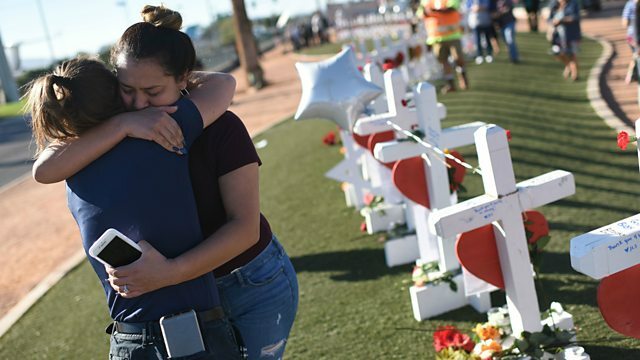 The news crews move on but the impact of a mass shooting such as the one in Las Vegas can last a lifetime for the injured and the families of the victims left grieving for their loved ones. Most simply want to be left alone to try to rebuild their lives. But one group of people in America won't let them, hoaxers who claim that mass shootings are hoaxes perpetrated by the government in the name of curbing civil liberties. Marcus Mancini is part of HONR, a network which campaigns against hoaxer activity. Image: Two women comfort each other beside 58 white crosses for the victims of the mass shooting on the south end of the Las Vegas Strip. Credit: Robyn BeckAFP/Getty Images.